The argument of communication and the mind centers on the use of language; the development of human understanding; and the derivation of meaning (especially in philosophical literature). Wittgenstein says that language in itself creates philosophical arguments. Many theorists have debated the complex problem of human language and communication, but none have come close to Wittgenstein and his ability to untangle the complexities that have arisen. Descartes and Locke have also written about language and more contemporary theories have come into fashion, such as semiology, which is concerned with signs. The greatest contribution to the study of signs is Saussure. One of the great troubles of communication and language is the interpretation of sensations and dispersal of ideas throughout subjects such as intellectual writings, philosophical problems and ideas. Cartesians mystify human understanding, while semiology over-simplifies it. In the next few blog posts I am going to discuss the philosophy of human communication and meaning, through an examination primarily of Locke, Saussure and Wittgenstein. Wittgenstein’s argument of Private Language in the Philosophical Investigations has had a profound impact on theories and theorists alike. He argues that language understood by its user can not exist objectively, as a necessary confusion arises. 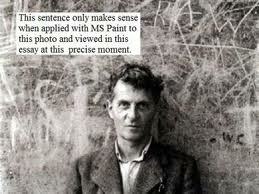 This idea is commonly misunderstood which accounts for the controversy surrounding Wittgenstein’s writings. The confusions that are supposedly integrated in human language also underlie and are subjected to philosophical language, notions, theories and method. This accounts for the lack of substantial movement from Platonic and Aristotelian thought. We cannot move forward because our language is deceiving us. Wittgenstein moves away from the previous Cartesian thought that it is internal processes that guides the interpreter to understand the message confronted to them. The message cannot be private, Wittgenstein argues. The processes of meaning and understanding are thought to be immaterial and taking place in a ‘spiritual’ recess of the brain. Wittgenstein argues that meaning and understanding are not processes at all. The language surrounding the description of mental processes needs clarification. Wittgenstein goes on to say that mental processes are processes in so far as they have a beginning, middle and an end, can be interrupted and described, but what is important is that they are not perceptible by others. Articulating sensations and experiences are what make the whole process possible. Mental images in our minds do not give rise to language or words to describe these images, but the words in our vocabulary give rise to the meanings we prescribe objects. As Wittgenstein argues “Language is itself the vehicle of thought”. It may be the case that we have no natural descriptors or expressions for all of the sensation that are perceivable by human consciousness, but Wittgenstein is saying that our language restricts us from accurately describing them. The problem is that one may not know if what an individual describes as a sensation is an accurate descriptor of it. While we describe sensations, we merely ascribe names to the sensation. However, the Private Language argument has been highly contested by commentators. Some believe it is supposed to prove something about language, others think it is supposed to prove something about the following of rules, and some think it is supposed to prove something about sensations. Some think he was not trying to prove anything at all. Kenny, Anthony John Patrick. 1931 – Wittgenstein. Pp 140-141. Teichman, J, 1988. Philosophy and the Mind. Pp. 50. This really is a problem I need to find more information about, appreciate the post.